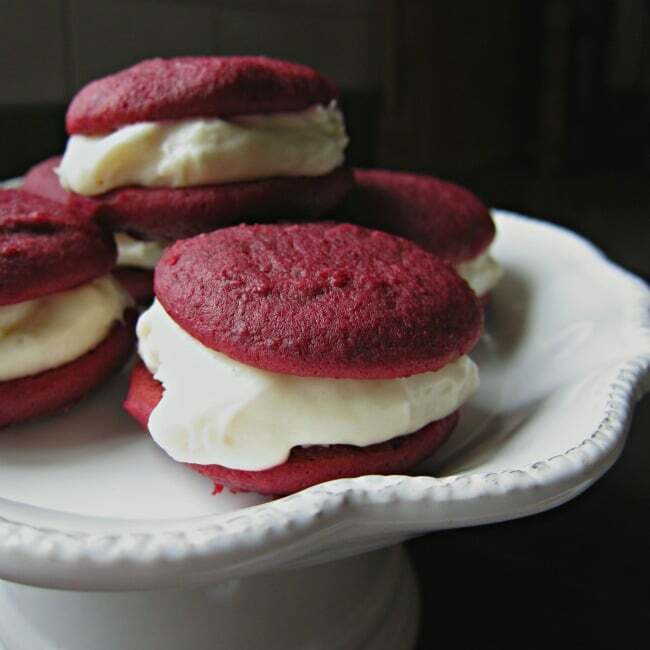 Red Velvet Whoopie Pies: smooth cream cheese filling sandwiched between soft cake like cookies. Best of all, that beautiful color is from natural ingredients! If there is ever a time for red velvet, friends, that time is right now. Last Valentine’s Day, I got off my food coloring high horse, sucked it up, and made red velvet macarons. They were scrumptious (of course), and a big hit (of course), but health-wise, I felt it was a compromise. When my sister got wind of it, she forwarded me a great Red Velvet cake recipe she had come across, that uses beets instead of artificial coloring! I’ve made it several times as cupcakes, and it’s just terrific. The author of the recipe (Sophistimom) has gone to great lengths to ensure that the color is a beautiful, vibrant, ruby red, and the cake itself is so moist and delicious! The beet flavor is extremely subtle. Mr. Allie has a deep and passionate hatred for beets, and when I made the cupcakes for the first time, I had him taste one without telling him the secret ingredient. He loved the cake and had no inkling whatsoever that it contained his most despised ingredient. I’ve been itching to make whoopie pies for a while now, so, I figured, let’s try putting a spin on Sophistimom‘s genius Red Velvet recipe! Cream butter and sugar together until nice and fluffy and pale. Add in the yolk and mix until combined. Then mix in the beet puree*, buttermilk, lemon juice, vinegar, and extracts. Now mix in the flour, cocoa powder**, baking powder, baking soda, and salt. In a separate bowl, whip the egg white to stiff peaks. Fold the fluffy egg whites into the cake batter. Drop 36 scoops of batter, about two inches apart, onto parchment-lined baking sheets. Bake for 12 minutes at 375 degrees. While that is going, make the filling. Just throw all the ingredients in the mixer and whip ’til fluffy! Once the cakes are all cooled off, just top half of them with a generous mound of the filling, sandwich, and enjoy! Cream the butter and sugar until fluffy, and then mix in the egg yolk. Add in the beet puree, buttermilk, lemon juice, rice vinegar, vanilla, and almond extract, and combine. Add the flour, cocoa, baking powder, salt, and baking soda and combine. In a separate bowl, whip the egg white until fluffy and stiff. Fold the egg white into the cake batter. Drop 36 scoops of batter, about two inches apart, onto lined baking sheets, and bake at 375 degrees, for 12 minutes. Cool completely, and fill with fluffy cream cheese filling. Whip all the filling ingredients together until fluffy. How do you feel about Red Velvet? Are you okay with the artificialiness? Maybe just once in a while? How about beets? Is this recipe something you’d be willing to try? *For the beet puree, just wrap a few beets in foil, and roast in a 400 degree oven for about 90 minutes, or until fork-tender. Peel and puree in the food processor. **Be sure to use natural cocoa powder, NOT Dutch-processed. If you substitute a cocoa that has been processed with alkali, it will mess with the pH of the cake and change the color purple. Still delicious but not so Valentiney. This is great! I used a juicer for the beets and had to add about a cup of flour and they came out perfect! Thanks for the recipe, everyone loves them! Great to know! 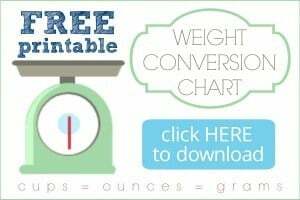 I don’t have a juicer but I’m sure some other readers may, so that’s great info! I’m so happy you like the recipe. Arent’ they so great for Valentines??? Thanks for stopping by, Jenna, and for the nice comment!